Thinking of going tech-free on your big day? Here’s how to let your guests know you’re hosting an unplugged wedding. While everyone loves their electronic gadgets and gizmos, they’re not the best wedding accessories. They can be noisy, distracting and really steal the spotlight from you, the happy couple. Because of this, unplugged weddings are really rising in popularity. If you’re considering asking your guests to leave their phones and cameras away on your big day, there are a few easy ways to get the message across. Here’s how to tell your guests you’re having an unplugged wedding. Know from the get-go that you want to host an unplugged wedding? You can include that information on your wedding invitations. Know that these pieces of stationery must include a lot of important details already (like place, time and date), so if adding an extra line makes them look overcrowded or messy, just skip it. There are plenty of other ways to get the message to your guests - just keep reading. You probably spent a lot of time finessing your wedding website, and this is one scenario where it can come in super handy. On your FAQ page include a short blurb explaining the concept of an unplugged wedding and why you’ll be embracing the idea for your big day. The more your guests understand, the more likely it is that they’ll follow your rules. Signage can be used to inform your guests of more than where to go to use the loo and where to head for the ceremony - it’s also a great tool for reminding your guests of little details, like turning off their phones. You can pretty up your message with a beautiful font, or make it a little more lighthearted by adding in a pun or cute saying. Who says something with a serious message can’t be beautiful? Before your ceremony begins, ask a member of your wedding party or your officiant to make a brief announcement to remind your guests to put any phones, cameras or electronic devices off (or at least on their silent setting) and away. The verbal reminder can be especially helpful for those who didn’t read the fine print on your invites, websites and signage carefully. While this probably shouldn’t be your first line of defense against technology at your wedding, putting a little reminder in your wedding ceremony programme (AKA order of service booklets) will really help make your point hit home. 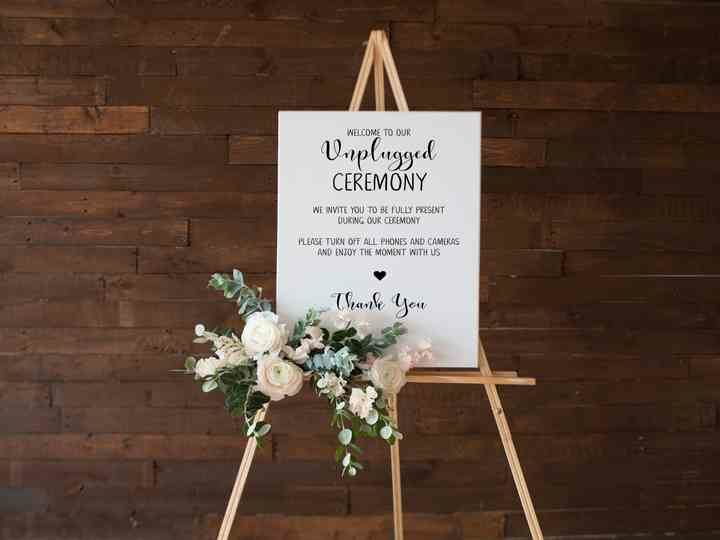 We suggest including a blurb that says something like “Please turn your phone off and leave it tucked away for the rest of the day - this is an unplugged wedding” to the front or first page of your pamphlets. Feel free to play around with wording and make it a little more lighthearted, if that’s more your style.